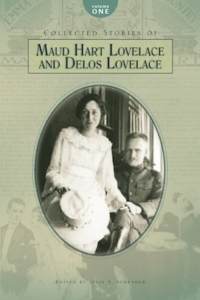 Maud Hart Lovelace, was born April 25, 1892, in Mankato, Minnesota.Like Betsy, Maud followed her mother around the house at age five asking questions such as “How do you spell ‘going down the street’?” for the stories she had already begun to write. Soon she was writing poems and plays. When Maud was ten, a booklet of her poems was printed; and by age eighteen, she had sold her first short story. The Hart family left Mankato shortly after Maud’s high school graduation in 1910 and settled in Minneapolis, where Maud attended the University of Minnesota. In 1917, she married Delos W. Lovelace, a newspaper reporter who later became a popular writer of short stories. The Lovelaces’ daughter, Merian, was born in 1931. Maud would tell her daughter bedtime stories about her childhood, and it was these stories that gave her the idea of writing the Betsy-Tacy books. Maud did not intend to write an entire series when Betsy-Tacy, the first book, was published in 1940, but readers asked for more stories. So Maud took Betsy through high school and beyond college to the “great world” and marriage. The final book in the series, Betsy’s Wedding, was published in 1955. 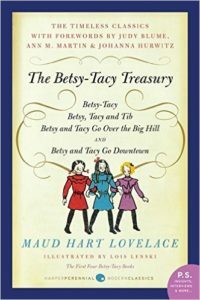 The Betsy-Tacy books are based very closely on Maud’s own life. 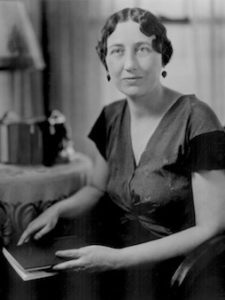 “I could make it all up, but in these Betsy-Tacy stories, I love to work from real incidents,” Maud wrote. “The Ray family is a true portrayal of the Hart family. Mr. Ray is like Tom Hart; Mrs. Ray like Stella Palmer Hart; Julia like Kathleen; Margaret like Helen; and Betsy is like me, except that, of course, I glamorized her to make her a proper heroine.” Tacy and Tib are based on Maud’s real-life best friends, Frances “Bick” Kenney and Marjorie “Midge” Gerlach, and Deep Valley is based on Mankato. In fact, so much in the books was taken from real life that it is sometimes difficult to draw the line between fact and fiction. And through the years, Maud received a great deal of fan mail from readers who were fascinated by the question—what is true, and what is made up? Maud Hart Lovelace is best known for her beloved series of Betsy-Tacy books which were set at the turn of the twentieth century in Mankato, Minnesota (Deep Valley). These captivating stories of small town life, family traditions and enduring friendships have captured the hearts of young and old for over 65 years. Few books engage readers of all ages and are passed from generation to generation as these books have. The honesty and detail of the books makes them interesting historical and social documents of the period, as well as entertaining reading for all ages. The “Betsy-Tacy” books have attracted interest from scholars since they represent a rare example of turn of the century literature written from a child’s perspective. All thirteen books in the Betsy-Tacy series were published by Thomas Y. Crowell Co. (now HarperCollins) between 1940 and 1955. Due to their popularity and demand, they were reprinted in the 1970s, 1990s. In 2000 HarperCollins released a commemorative 60th anniversary edition. The books have been translated in many different languages including German, French, Italian and Japanese. Of the six historical novels she wrote, she collaborated on two of them with her husband Delos, One Stayed at Welcome and Gentlemen from England. Four of the six novels are in print and available from our gift shop. Maud Hart Lovelace started her career writing short stories and submitting them to magazines. In 1911, at the age of 18, she sold her first short story, Number Eight, to the Los Angeles Times Sunday Magazine. Delos Lovelace was a freelance writer for seven years and quickly became a successful story writer. He sold 50 stories to a single large national magazine and was paid up to $1000 each for them. His stories sold to all of the popular magazines in the 1920s, such as Country Gentlemen, The Saturday Evening Post and the Ladies Home Journal. The Lovelaces wrote short stories prolifically, both individually and in collaboration. For every short story sold there were also rejection letters. “When I saw how well his [Delos] stories sold,” Maud said, “I decided that maybe I wasn’t cut out to be a short story writer.” With Delos’ encouragement, Maud turned to writing historical fiction. 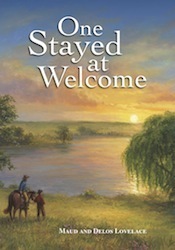 Some of these short stories are available in a 2-volume collection available in our gift shop.